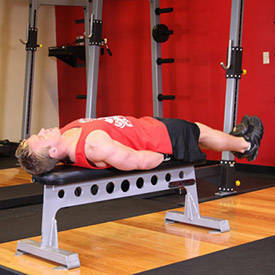 Lie with your back flat on a bench and your legs extended in front of you off the end. Place your hands either under your glutes with your palms down or by the sides holding on to the bench. This will be your starting position. As you keep your legs extended, straight as possible with your knees slightly bent but locked raise your legs until they make a 90-degree angle with the floor. Exhale as you perform this portion of the movement and hold the contraction at the top for a second. Now, as you inhale, slowly lower your legs back down to the starting position. Variations: You can also perform this exercise on the floor on top of an exercise mat. You can also add weight by holding a dumbbell in between your feet as you get more advanced.